Honso Kampo® Granules manufactured by Honso Pharmaceutical Co., Ltd. in Nagoya, Japan are easy-to-use, standardized, and highly effective formulas. Each lot is routinely tested for key herbal constituents, heavy metals, purity and microbial content under requirements of the Ministry. The finished herbal formula is then scrutinized further to measure at least two active constituents quantitatively by HPLC to ensure consistency. 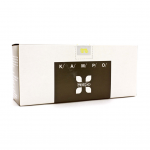 Japanese Kampo formulas are scientifically validated by hundreds of clinical and laboratory studies. Pharmaceutical-grade quality, unique packaging, strong research, a track record of safe usage and exclusivity for licensed practitioners make this product line the right choice for all healthcare specialties. In 1967, the first four Kampo formulas were approved for coverage under the national health insurance system. As of today, this number has increased to 148 prescriptions approved by the Japanese Ministry of Health, Labour and Welfare (the same central government body as the US FDA that regulates pharmaceutical manufacturers). In 2001, the Ministry of Education, Science, and Technology also set new guidelines that called for the incorporation of Kampo medicine into the core curriculum of Japanese medical schools, and as of 2005, all medical schools in Japan have made the necessary changes to their curricula. Every approved formula produced by different manufacturers is composed of exactly the same ingredients under the Ministry’s standardization methodology.